Three generations after women first complained of a glass ceiling, just twenty-one have become chief executives of the world's biggest 500 companies, and even that small number is a record, with half of them landing the top job between 2011 and 2012. A study by Dow Jones recently found that start-ups with five or more females in executive positions only failed 39% of the time, as opposed to an average of 75% for the typical start-up. The report also found that the fewer females, the more likely the start-up was to fail. A recent EU proposal wants 40% of non-executive directors at public companies to be female, and new books from Facebook Chief Operating Officer Sheryl Sandberg, and former State Department official Anne-Marie Slaughter are seeking to empower women in the boardroom. 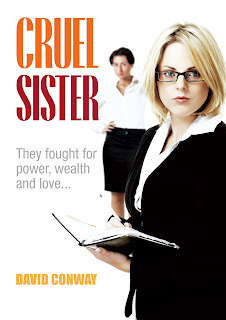 Cruel Sister chronicles a power struggle within the Ryan dynasty. Born into a poor immigrant family, Connor Ryan has built the twelfth largest corporation on earth. When he passes control to his eldest daughter Branna, his younger daughter Niamh feels betrayed. After a bitter argument, Connor agrees that Niamh can take control of a derelict hotel, and she pledges to increase its value tenfold in one year. If she succeeds, Connor secretly promises her Branna's job. Niamh finds herself on a journey which divides her family, wrecks her health and even threatens her sanity. Branna, who will stop at nothing to thwart her, sets a myriad of traps and steals the man she loves. A former journalist with a lifelong interest in leadership, David Conway has spent the last twenty years of his life devising and organising events which celebrate the work of leaders and achievers. He has personally presented leadership awards to - among others - Senator John McCain, Senior US Senator for Arizona; and John Rose, former Chairman and Chief Executive of Marks & Spencer. He has also presented awards to mayors and leaders in cities from St Louis, to Amman and Lagos. In 1997 he devised the SET Award scheme which has become Europe's leading award for science and engineering undergraduates. Cruel Sister, to be followed by a sequel, is his first novel.